Borehole orientation follows a convention of deviation/deviation azimuth. For example, 5°/135° indicates 5° deviation from vertical towards 135° (south east). 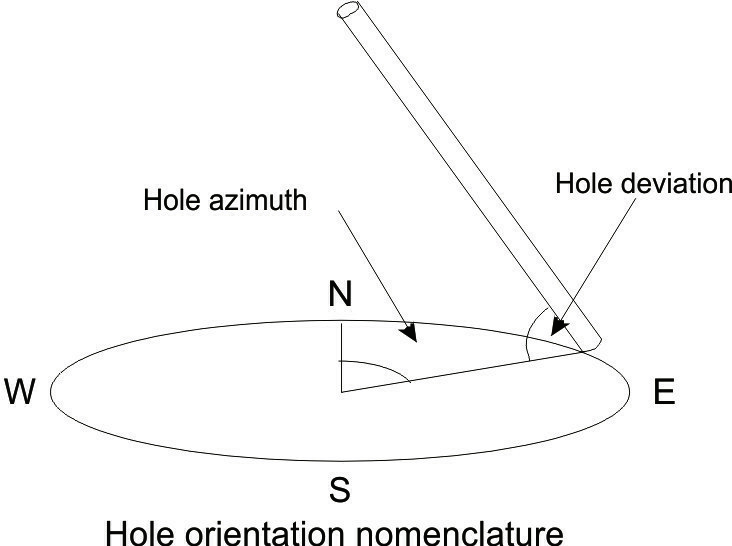 Hole orientation is usually detailed in degrees (very rarely in radians) as hole deviation and hole azimuth (or drift) each of which can have a range of different mnemonics dependent on individual service companies. It is important to know which North (magnetic, geographical or grid) is being referenced in any survey. Note that hole orientation is measured from the vertical unlike the attitude of geological features that are recorded from the horizontal. See also dip orientation nomenclature.